Now available from Truman State University Press and Amazon. An interview on the book is here, conducted and published by the wonderful people at TSUP. 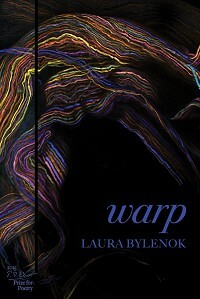 You could call Laura Bylenok’s Warp an extended meditation on a word, but during the course of her remarkable investigation she shows us that her word, perhaps like any other, is all but singular. To warp word into words, even in the act of meditation, is to engage the entire multiplicity of language, all its gorgeous meanderings and torques. Bylenok is an inveterate follower of language into wherever it leads–play, tragedy, time–and her own warpings, transmutations, and glorious reinventions (“swoon” into “swerve”; “aurora” into “ouroboros”) show us that if language is the perpetual lens of the poet, it is always turning us into new ideas. In these poems, play is the method, but play as serious pleasure. Bylenok shows us again and again how, in pressuring our language, we reshape ourselves and our deepest understanding of reality.